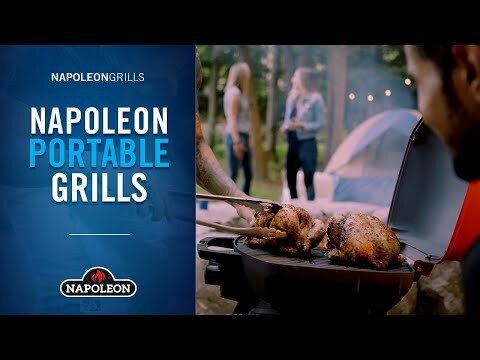 Grilling on the go made easy with portable grills from Napoleon. The Napoleon TravelQ portable propane gas grill provides up to 12,000 BTUs and 285 square inches of cooking area. This portable grill is attached to a scissor cart that folds for easy storage and you can even hang it on a wall. The integrated side shelves provide valuable workspace while grilling and the large wheels make transporting the grill a breeze. The removable, porcelainized cast iron wave cooking grids create the trademark Napoleon sear lines. The TravelQ has dual stainless steel burners, allowing you to cook directly over the heat or indirectly for low and slow style cooking. The Napoleon electronic Jetfire ignition with crossover lighting starts both burners individually for a reliable start up every time and allows you to light each burner at the same time. The lid locks to keep it secure and features a wind proof design which holds in heat. An Accu-Probe temperature gauge is built into the lid for easy temperature monitoring. Easily setting up in 10 seconds, the grill has a removable grease tray for easy cleaning and uses a standard one pound propane gas cylinder. Cooking Grid Dimensions 21 1/4 X 14 1/2"
21 1/4 X 14 1/2" 21 1/4 X 15 1/4" 14 X 10" 21 1/4 X 15 1/4"